AllegroMedical.com presents The Sofsheep Sheepskin Crutch Accessory Kit. 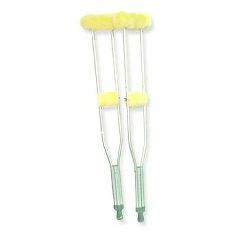 This 100% genuine medical sheepskin crutch accessory kit is designed to provide optimum comfort, and covers both the underarm and hand grip portions of standard crutches. Underarm and grips feature dense, resilient wool pile sheep skin that holds up well to continued use. This absorbs twenty times more moisture than synthetics and allows air circulation for warmth in winter and coolness in summer, keeping skin healthy. Remains soft and pliable after repeated laundering (machine wash and dry). Underarm pads are 9.5" long and handgrips measure 4.5" x 6". Both have hook-and-loop fastener(s) closures.